It took me some time to decide the appropriate name for this post. Really the idea is repurposing, but the idea is also to be creative with something simple and blank, by which we are continually surrounded. I have a current fascination with birdhouses, and am even adding quite a bit of decor around the subject to my previously empty shelves and walls. It’s amazing how little I paid for these items, seriously. I found many of these items at local (chain) craft stores, and a Goodwill store. Some items required very minor repairs (the hanging above the door was missing something on the front, so I stuck a fabric butterfly sticker on it). Others were able to be used as is. There is a project here, that can be done with your children. In fact, all of my projects seem to begin by my attempt to entertain my children. This one was no different. We found these little birdhouses at Joann’s in a bin for $1 per!! The store also had larger models for around $5 each. We stuck with the small version so we could buy a greater number to play around with. When we got home, I don’t think we were in the door more than 38 seconds before Amy asked if she could start painting her houses. I conceded, and she quickly broke out all the acrylic paints, brushes and trays. It wasn’t much longer before I wanted to join in her fun. So we painted!! Amy decided she wanted to continue decorating her houses, so I showed her where the glitter, jeweled and fabric butterfly and heart stickers were. I loved her finished product! I was proud of her and decided to mount a shelf in the living room to showcase her artwork. I had a little something different in mind as an end result, but Amy had creative license on her items, and wouldn’t allow me to touch her birdhouses. I completely respect that, so I had to finish painting my set and get to work on embellishing my own, in a similar manner to what she had done, but that’s where the similarities end. I had envisioned a stack of these little houses, enveloped in various ribbons and charms, so I dug into my bucket of goodies (it is actually a bucket, filled with items I have found at chain craft stores on clearance, and includes buttons, chains, twine, ribbons, pins, patches and charms. I used her glue stick and my needle nose pliers to wrangle the bits I wanted into place, and voila, my structure is complete. The most beautiful part of this project is that anyone can go to the craft shop and invest just a few dollars for at least an hour of fun with their kids. 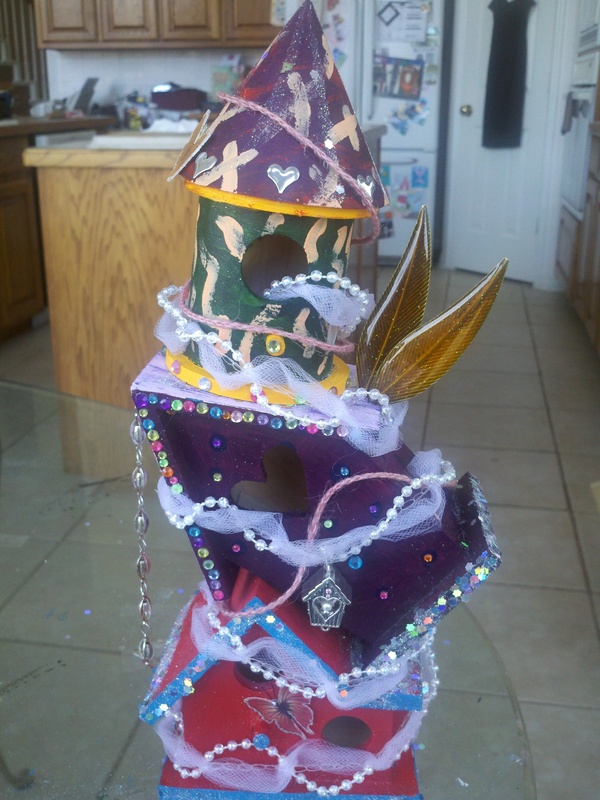 Your birdhouses will turn out as beautifully as you can dream them up to be. Just use your imagination!! Happy crafting!